Overcoming Clicktivism by Building Stronger Ties. 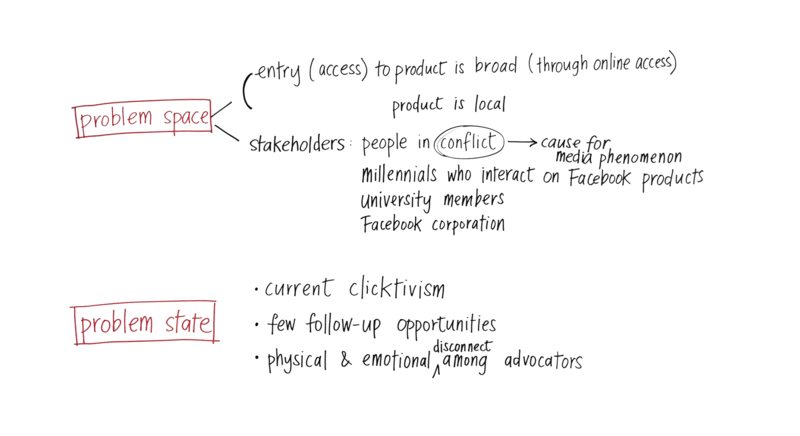 Hypothetical product concept for a Facebook Interactive wall on college campuses, to promote conversation and collaboration in activism or civic engagement. This project was in collaboration with Kate Apostolou, Rae Headrick, and Julia Wong. I was responsible for the entry and exit points of the product (interaction & mobile application interfaces), filming & editing product videos, and being part of research, concept development, determining user flow, problem space, and goals. Clicktivism. A buzz-word with a negative connotation, associated with social media-crazed Millennial and the kind of "activism" they participate in, or lack thereof. This sort of activism is reduced to a "like" or a "thumbs up" or a "share" on Facebook and re-tweeting or hash-tagging something on Twitter. All of this is click, type, go. The content that you just "supported" or shared is just another scroll through your feed, next to the viral cat video. There is no follow-up action or accountability when it comes to "Clicktivism". We have such a disconnected community, made up of virtual "friends" that define our network. You are just another "like" or re-tweet, and a username in the server. Overcome "clicktivism" by providing a platform to facilitate meaningful activism. 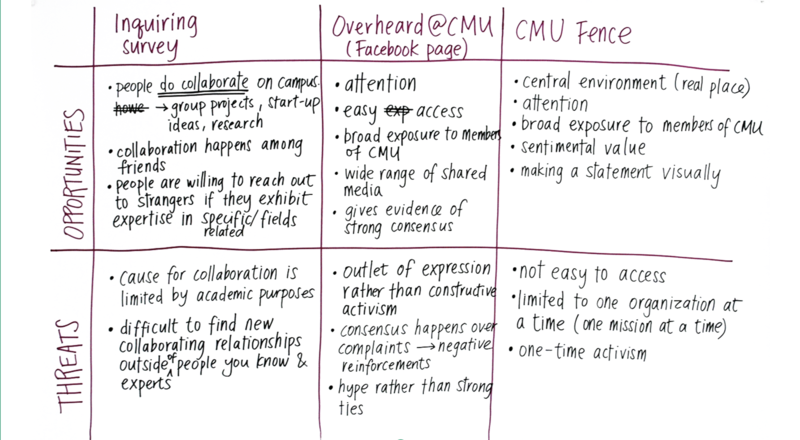 Our process started with understanding the current temperature of engagement on CMU campus. How are students currently interacting and collaborating on campus and how can we leverage those behaviors for the pursuit of a more civically engaged campus community? We worked to incorporate Carnegie Mellon students’ current behaviors and values into a product that would not only offer exciting opportunities to impact people around the world, but also build rewarding, strong-tie relationships in the meantime. The following is a proposition statement that communicates what we addressed in this project and how. ‍We aim to answer the "now what?" that comes after clicktivism. 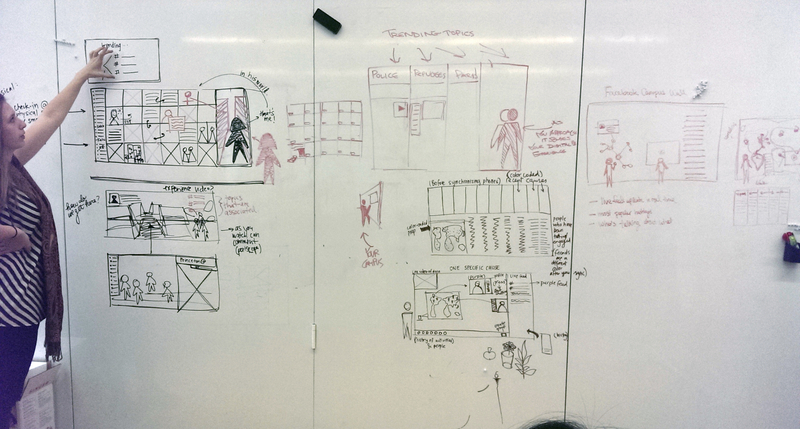 Before designing a solution, our team spent time to understand and clearly communicate the problem space and proposed problem statement. 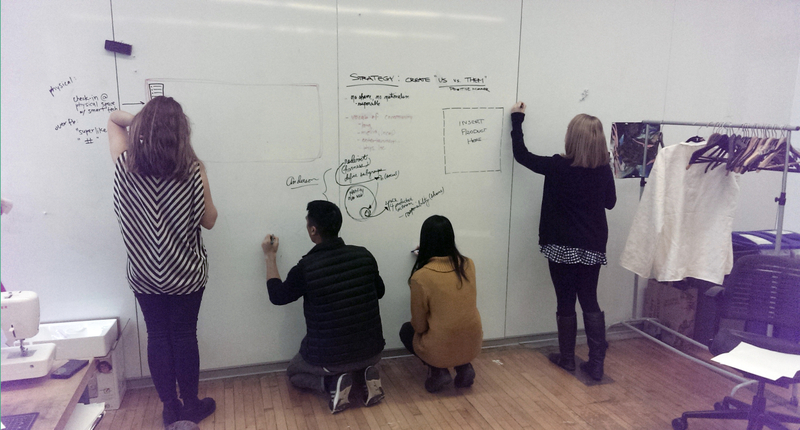 To test the strength of the product concept, our team used SWOT diagramming to think critically about all facets of the problem space and solution. 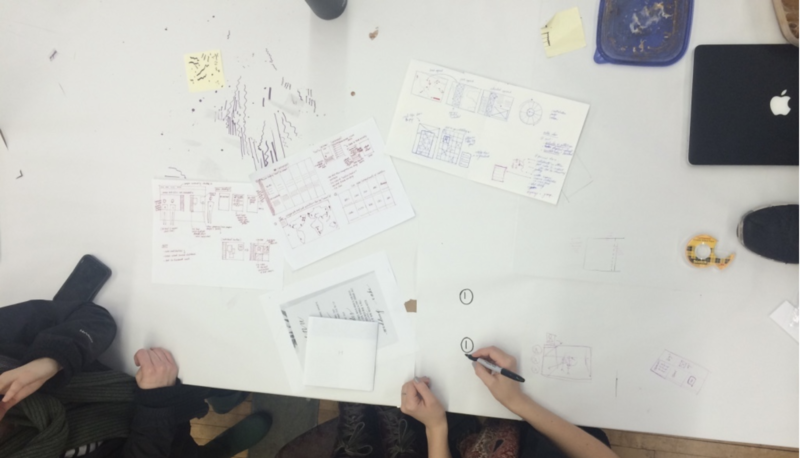 Before developing a product for this problem space, our team searched for evidences of student needs associated with civic engagement, as well as current manifestations of it on Carnegie Mellon campus. 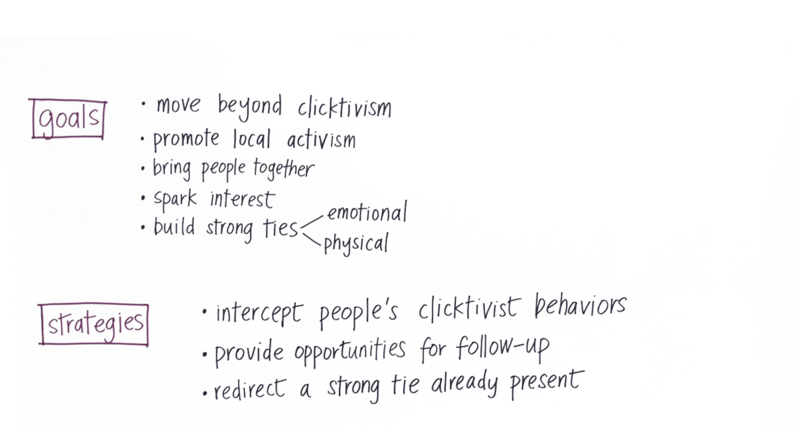 To prevent "clicktivist" behavior in the future, you must first intercept existing "clicktivist" behavior. When someone has the opportunity to "like-and-scroll", we hope to give them an alternative, where ideas and connection can tangibly be exchanged and interacted with. We want the user to be able to connect with other users that demonstrated similar activist behaviors to potentially start something bigger. With constant social media updates and the omnipresence of smartphones, the logical entry point is through existing social media. 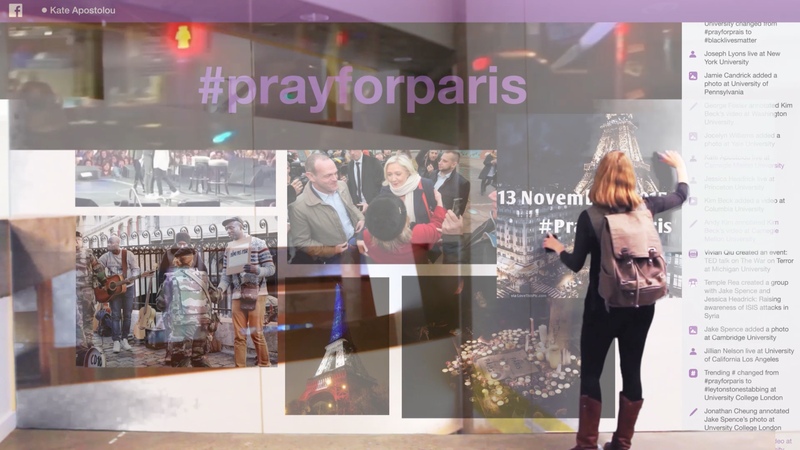 We propose a supplementary Facebook product that allows engagement and interaction online and in a tangible environment — an interactive physical Facebook wall on select college campuses that caters towards activism. When the users are at the campus wall, they are prompted to check-in to the wall by tapping their phone onto the wall. Once checked-in, they cannot perform any activity on their mobile facebook app, to encourage physical interaction with the wall. This campus wall strives to mirror the Facebook UI by showing who is "live" on your campus and other CampusWalls in other campuses. This is perhaps the most important feature of the wall. With a pen tool, users can annotate images and videos live. It provides a laid-back but informative entry into discussions and collaboration among users at the wall, since users can annotate together, comment on previous and each other’s annotation, which facilitate actual human interactions. The annotated materials eventually aggregate into a crowd-sourced database that may be updated constantly. The annotation also adds live feedback for the next user viewing the same material at the wall, which strengthen the sense of connection among users active about the same cause and same location. Throughout the whole process of interaction, if users find interesting materials, they can choose to save them into their own profile by clicking save and tapping on their names, which are registered when they check in. After annotating a material, a video for example, users can choose to save the video along with everyone’s annotation on it for reference later. On the side, campus happenings related to the specific cause will be broadcasted. Users can scroll through them, and choose the ones they are interested in to join by clicking their names next to the events and add them to their own calendar. When users are ready to leave, they tap their phones to check out. They are then prompted to a summary page, recapping annotations, things you saved, events you joined, & people you met. It will be added to your existing Facebook interface. Each user has their own purple profile dedicated to the cause & the related actions. 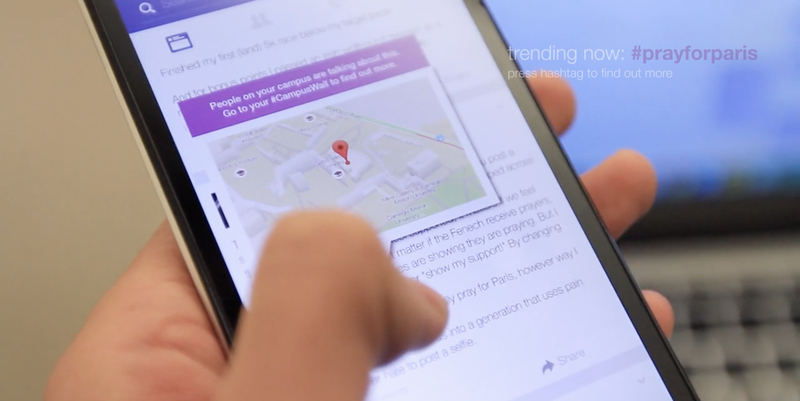 The purple profile closes the loop to create a more meaningful experience with the wall, by integrating it back to the initial frequently-used touchpoint, Facebook. 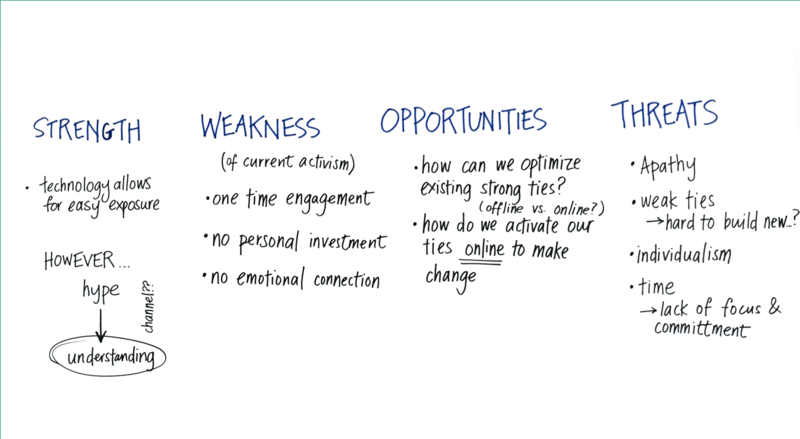 This experience at the wall will not create immediate change, but provides a platform for users, advocating for the same topic, to build, start, and interact with connections, with the end goal of building stronger ties. This is the underlying goal that will eventually spark change. Changes simple "clicktivism" to something more tangible.